Just as it did with its colorful puzzle game Critter Crunch, Capybara Games' Might & Magic: Clash Of Heroes is getting the high-definition once-over, making the jump from Nintendo DS to PlayStation Network and Xbox Live Arcade later this year. Ubisoft and Capy's high-res port of 2009's best puzzle-RPG looks to maintain the same solid strategic gameplay but with completely redrawn graphics and, as seen in the debut trailer below, more spectacular spell animations. IGN's write up of the game indicates that Capy will be tweaking some of the game's mechanics as well as taking the multiplayer portion online. 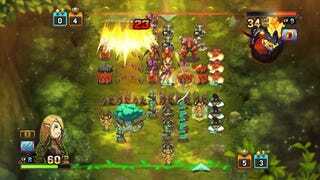 We'll know more about Might & Magic: Clash Of Heroes HD when we speak with Capy at GDC later this week.